Protect and Defend your networks from attacks. The International Council of Electronic Commerce Consultants (EC-Council) is a member supported professional organization. The purpose of the EC-Council is to support and enhance the role of individuals and organizations who design, create, manage, or market Security and E-Business solutions. 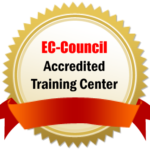 As an EC-Council Accredited Training Center, Global Information Technology offers EC-Council Authorized training. Candidates for EC-Council certification must complete authorized training as a pre-requisite to earning certification. Please note: Candidates are only allowed to take training from Authorized Training Partners as a precondition of taking the certification examinations.